I love watching makeup tutorials so much that, three hours have literally passed. I remember watching my first ever makeup tutorial. It was from Dulce Candy and I was thinking wow if only I was that talented. The title of her video is called "Makeup For Beginners"! Now lets be honest I am not a makeup artist nor do I have the talented of creating nice makeup looks. I don't even where makeup except the basics. 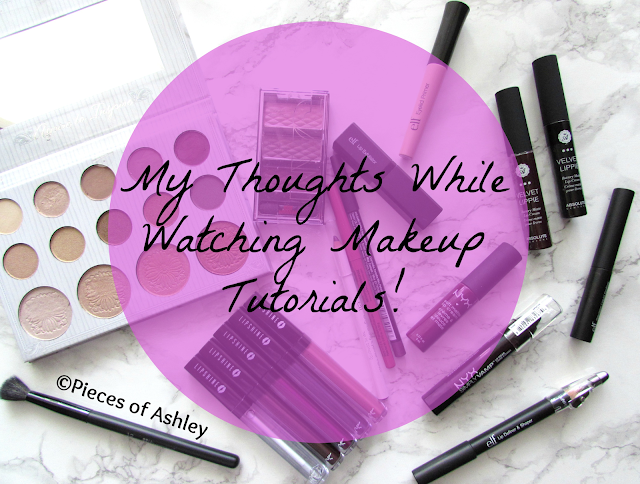 So I decided to share with you the things I think about, while watching YouTube videos and looking at makeup pictures. You will probably be surprised and hopefully you'll have a little laugh. If not then I really made a fool out of myself with this one! I actually laugh at myself for this, which means I'm probably weird now! Anyway, here's my thoughts while watching makeup tutorials. "Girl you better work it, wing on fleek. Is that word still in?" "I Wish I Could Pull That Off." "I Would Be Caked up." "That's probably why I'm not a professional, I would get sued." "This Is the kind of baking I want to see." "I should probably stick to eyeliner and lipgloss." "I'm too lazy to put on false eyelashes." "I don't even know how to put on false eyelashes." "I guess I'll just stick to the little ones I have." "Am I the only one clueless about makeup." "Am I the only one who secretly acts like I know what I'm doing." "Primer when did that come out." "How do they put on eyeliner without crying." "Am I the only one who makes weird faces while applying eyeliner." "Am I the only person having problems putting on lipstick." "I'm probably the only one who's lipstick doesn't actually go on their lips." "Putting on lipstick is like using a coloring book, why am I difficult." "I really need to stop putting so much eyeliner on, especially when it's hot." "What if people found out that I don't know how to contour." "I'm not that good with makeup terms, where's the dictionary." "This is my 10th time watching someone do a winged eyeliner, when will I learn." "I'm pretending that I know what to do." "I'm just going to pause this video to see if I could recreate this look." "Girl you are going to ruin it." "Are you really going outside like that." "Turn on the fan so you won't sweat the makeup off." "I can't wait to take a picture after this." "I really could have waited to take this picture." "I feel like I did the blindfolded makeup challenge on myself." "It looks like I'm doing the no mirror makeup challenge, even though I'm looking in the mirror." I hope you enjoyed reading this and let me know the thoughts you have while watching tutorials! Haha! This made me laugh, I more or less think the same things when watching makeup tutorials. Hahaha I love this!!! The last one about the no mirror challenge!! Girl this is sassy! Hahaha I loved reading this! I have some of the exact same thoughts when watching makeup tutorials! I even comment on makeup posts saying things like this! I laughed so hard while writing this post!